Edgar Degas was born in Paris France on July 19, 1834 to Célestine Musson De Gas and Augustin De Gas who was a banker. He was the oldest of five children. Degas began to paint as a young boy. By the time he turned eighteen, he had turned his bedroom into an artist's studio. Soon after that, he registered to be an art copyist at the Louvre museum in Paris. 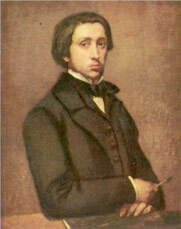 In 1855, Degas met Jean Auguste Dominique Ingres whose art he respected very much. He never forgot his advice: "Draw lines, young man, and still more lines, both from life and from memory, and you will become a good artist." Later that same year Degas enrolled in the Ecole des Beaux-Arts and studied drawing with Louis Lamothe who was a former student of Ingres. Degas' Little Dancer of Fourteen Years, which he displayed at the sixth Impressionist exhibition in 1881 is one of his most famous works. It was also one of his most controversial. Some art critics thought it was "appalling ugliness" while others called it a "blossoming." He wanted to show his dancer at rest, in an unposed way. The young dance student that posed for Degas was Marie van Goethem. Though she never became a famous dancer, she always will be remembered. 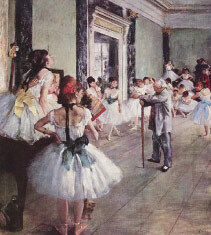 By the end of his life, Degas was considered an important artist. He is known for his images of ballet dancers, romantic Paris night-life and horse races. Edgar Degas died on September 17, 1917 in the city of his birth. His colorful paintings and sketches of everyday life crossed over the accepted ways of creating art. Once criticized for its "appalling ugliness", his art is now considered a collection of great beauty. Degas himself is now recognized as one of the greatest artists of the Impressionist Era. Like many of the dancers in Degas' art, these ballerinas are not performing or even posed. He has caught them at unglamorous moments in their practice hall. 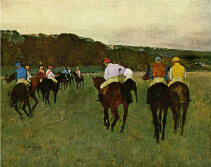 Though Degas is remembered best for his images of ballet dancers, his works of thoroughbreds and their jockeys are equally significant. Degas was drawn to the beauty and power of this subject and was fascinated by the nervous tension of horses and their riders.